Okay, so we cheated. But really, how can we not? The wealth of text adventures in the genre’s early days could fill up a best-of list all on their own, many of them supplied by Infocom. 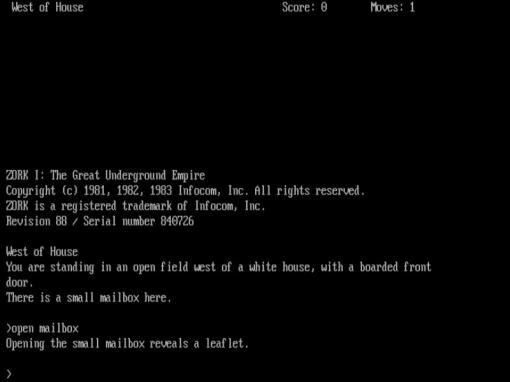 The company who helped catapult the genre (and computer games in general) to the forefront with the original Zork went on to produce a prolific lineup of successful adventures for the better part of a decade. Founded in 1979 by several MIT staffers, Infocom was the name in interactive fiction until it was bought out by Activision in 1986 (though new games continued to appear under the Infocom label for some time after that). Infocom text adventures eschewed the rudimentary graphics emerging at the time to create rich virtual worlds filled in as much by the player’s imagination as the extensive descriptions offered on-screen. The text parser, while certainly limited in scope, nevertheless offered an unparalleled level of immersion in directing your own adventure. Such freedom to experiment has since been sacrificed in the name of point-and-click accessibility – a loss that many lament to this day. But who can pick just one? Written by co-founders Dave Lebling and Marc Blank, plus other noted “Implementors” like Steve Meretzky, Brian Moriarty, and Bob Bates, the choice of favourite Infocom games ultimately came down to preferred genres. Fantasy lovers were rewarded with the Zork and Enchanter series; sci-fi fans were treated to classics like Planetfall, A Mind Forever Voyaging, and The Hitchhiker’s Guide to the Galaxy. Not your cup of tea? There were mysteries like Suspect, The Witness, and Sherlock: The Riddle of the Crown Jewels; and comedies such as Leather Goddesses of Phobos, Bureaucracy, and Hollywood Hijinx. Many still think that The Lurking Horror is the most terrifying adventure to date. The list goes on. Often sold in bookstores, the games even included notable “feelies” to serve as copy protection, though most were treasured as bonus extras in their own right. It was a different era then, and a magical time to live through for those who were a part of it. The text adventure lives on today in a thriving Interactive Fiction community, but the adventure genre itself owes much to the undisputed early brilliance of Infocom. 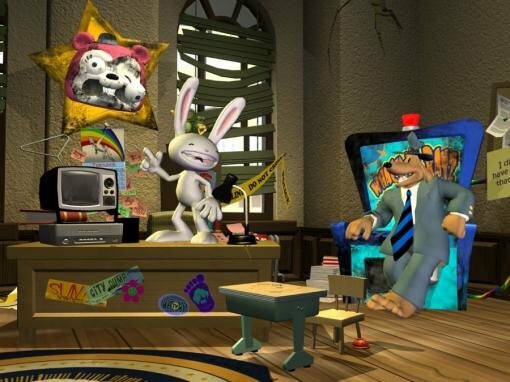 It may seem unusual to treat five separate releases as one entry, but the five installments of Sam & Max: Season Two combine to form an exceptional work when taken as a whole. Unlike the first season of Telltale’s episodic revival of everyone’s favorite canine shamus and hyperkinetic rabbity thing, where the episodes were knitted together only by a thin thread, there was a real connected story the second time around – an absurdly bizarre and unspeakably insane one, of course, which begins with gunfire and demonic possession as a backdrop for the Christmas holiday, continues through trips to Easter Island, the undead city of Stuttgart and its vampire raves, takes a diabolically hilarious time travel sojourn, and ultimately winds up with an infiltration of the nefarious corporation known only as Hell, LLC. And yet none of that description even hints at the hilarity of the brilliant writing and puzzle design on display. Throughout the season (which came to be known as Sam & Max Beyond Time and Space in console ports), the humour is top-notch absurdism, with perfect references to past events in the series and nearly ideal use of supporting characters to maximum comedic effect. Telltale wisely extricated themselves from the need to make each episode standalone, as they did in Season One, and instead went all-in for the cliffhanger approach. At the time we described the series as “completely, certifiably nutso” and therein was the incredible magic and charm of the experience, the full realization of what Steve Purcell’s beloved characters were meant to be. Thanks to those infamous “marketplace realties”, a Freelance Police sequel once seemed never meant to be, but in Telltale’s hands, Season Two became a modern classic exploding with the ambition and lunacy of the best Golden Age comedy adventures. 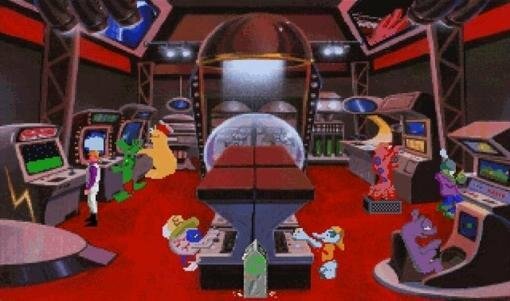 Any of Sierra’s Space Quest games could rightfully stake a claim as the series’ best, but there are mainly two words for why Space Quest IV: Roger Wilco and the Time Rippers gets the nod. No, not “Scott Murphy” or “Mark Crowe”, though the self-proclaimed Two Guys from Andromeda penned consistently hilarious scripts. Rather, it’s “Gary Owens”, the Laugh-In announcer who was nabbed to voice the narrator in the 1992 CD-ROM release a year after the original floppy disk version. Owens delivered a masterfully sarcastic, over-the-top performance that raised an already funny franchise to otherworldly heights. He even made dying hilarious, which is a good thing, as you’re likely to do so many, many times. Those aren’t the only laughs, of course. Though there are more pop-culture references and less sci-fi parody here than in other games, the superfluous “Taste” and “Smell” interactive options offer plenty of amusing responses as well. The time-travel plot is a predictably zany hodgepodge of events, as Roger unwittingly (does he know any other way?) finds himself transported back and forth through time, from his original adventure in Space Quest I to a fictional future sequel in Space Quest XII. The game itself was entirely modern for its day, however. This was the first game in the series to move from text parsers and EGA graphics to the brave new world of point-and-click, VGA graphics, and the upgrade was significant. And when the CD “talkie” version was introduced, it came at a time when few other games were yet making use of the new medium, making this game one of the more progressive adventures of its era. Yes, there are dead ends and the puzzles can be unintuitive, but as the funniest game in one of the most storied adventure series ever, it’s Space Quest IV that stands above the rest. Level-5’s Professor Layton and the Curious Village is a game full of puzzles – lots and lots of logic puzzles. Sound boring? It’s not! Already popular in Japan but virtually unknown around the world before its 2008 release, the game is ideally suited to the portable Nintendo DS and brief rounds of on-the-go gaming. And yet it’s addictively easy to become obsessed with overcoming devious wordplay, deceptive riddles, and puzzles that have you manically (or strategically, if you’re patient enough) sliding pieces around. There are even puzzles that convince you that you’re doing math when you’re really not. The challenges are confounding, surprising, and full of “aha!” moments – the kind that fill you with elation because you were sure you’d never be able to solve that one on your own… though there are always hints if you really can’t. But this isn’t just a puzzle game by any means. These brainteasers are wrapped in a beautiful, charming, and cozy cartoon-like presentation. Plentiful cinematics fill the tiny DS screen with rich, lively animation and crisp dialogue. And when you’re not knee-deep in a puzzle, the game has you out adventuring with top-hatted English gentleman Professor Layton and his plucky sidekick Luke as they attempt to locate a secret artifact. All around them are quirky, eccentric townsfolk to chat with, and a myriad of collectibles and minigames to discover. 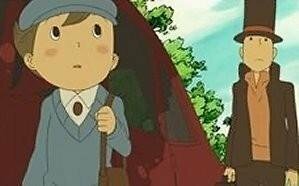 Other Layton games have continued to carry the torch, but Curious Village was the first to capture our hearts and strain our brains. Who knew a collection of a hundred-odd puzzles could make for such a wonderful, cohesive adventure? Sequels can all too often be lacklustre retreads of their predecessors, but such was not the case with Presto Studio’s Legacy of Time in 1998. The final installment of The Journeyman Project took new paths to form a memorable conclusion to the trilogy, while still being mindful of its roots. With Earth under pressure to dismantle its time travel technology, the agency tasked with protecting time is unprepared when a massive disturbance hits, so returning hero Gage Blackwood is sent back in a prototype suit to investigate. There he meets old foes and friends (including fan favourite, Arthur the A.I. ), and thwarts a conspiracy that could destroy the world. The story rounds off the overall arc skillfully, providing better insight into the motivations of the villains and showing things weren’t quite as black and white as we thought, which makes for a particularly satisfying conclusion. 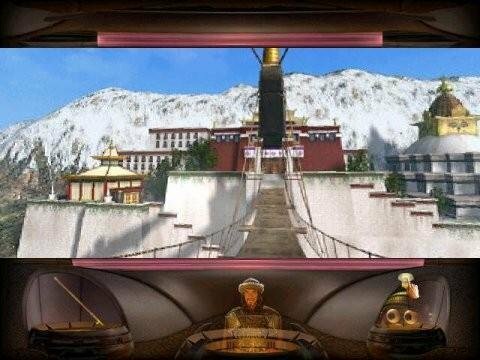 The lush historical scenes, from warm Mediterranean waters to the snowy Himalayas, get a much bigger share of the screen this time, a deserving increase given the loving detail lavished on them. They also smoothly incorporate FMV characters into their computer-generated backgrounds. The controls have also been streamlined, making for a much smoother interface than before. For the first time in the series, you even get to interact with people in the past. Through the chameleon ability of the prototype suit, you can copy the appearance of natives, allowing you to subsequently wander around and chat with others undetected. The different reactions you get based on who you are impersonating keep things interesting, and are also integral to the puzzles. With Arthur as witty and informative a companion as in the previous installment, the sum total is a triumphant sequel that offers an enduring legacy of entertainment.